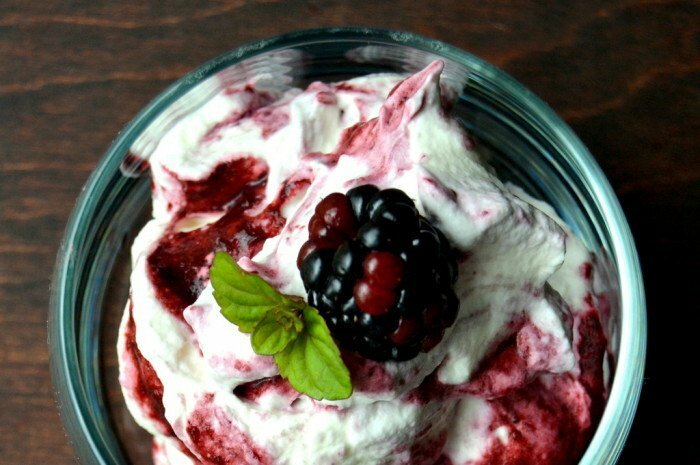 In a food processor puree the berries, Brandy, and lemon juice until completely smooth. Push the puree through a fine mesh strainer, using the back of a spoon to get as much of the mixture through as possible. Discard the seeds. Whip the cream until it starts to thicken, then add the sugar and vanilla. Whip until it forms stiff peaks. You want the cream to be whipped until firm so that it doesn't break down when you add the berry puree. But don't go too far or you will make butter! Fold part of the berry puree into the whipped cream, using a silicone spatula. Just fold it in lightly so that you still have streaks of purple and white. You can serve it from one bowl, or spoon it into smaller serving bowls or glasses, layering with fresh berries and more puree, if you like. The fool can be refrigerated for up to a few hours before serving.